The Oil Drum: Europe | Have Oil Prices Bottomed Out? This post is an English translation of an article written by Jorge Nascimento Rodrigues and published in the 28th of February in the Economy section of the Journal Expresso, the largest weekly publication in Portugal. It is built on the insight kindly provided by TheOilDrum contributor ace. Crude oil prices might be back to a mid term bull market, says an Australian analyst. February showed significant price variations from one day to the other and the American variety [WTI] climbed 10%, increasing from $40.78 to $44.76 per barrel. An audio version of this post can be downloaded here. Minimum prices for a barrel of crude oil, since the peak in July of 2008, may have happened before Christmas of 2008, according Anthony Eriksen, an analyst for TheOilDrum. Eriksen is a Canadian mathematician located in Sydney, Australia, where he specializes in energy and mining investments. The conclusion that can be made is that the price of a barrel might be back to a mid term bull trend, after a fall from $145 to less than $50 in the span of only six months last year. Eriksen points out that prices of the American crude (WTI) and of the European (Brent) touched their minimum values of $31.41 per barrel in December 22, 2008, and $34.04 on Christmas Eve, respectively. This year, the lowest prices occurred last week, on the 18th of February, with values of $34.62 for the WTI and $39.10 for Brent. The International Energy Agency (IEA) forecasts a price range between $40-$45 per barrel, which would still be below the wishes of many producing countries. These countries require a minimum of $50 barrel for many of their planned projects to be viable, both economically and technologically, emphasizes the analyst. On February 26th, the price of a barrel of the American WTI variety reached a price slightly above $45 and closed at $44.76 dollars. The Brent variety closed the month at a price ($44.72) practically identical to the opening figure ($44.46). 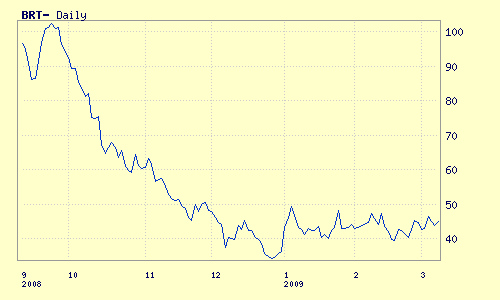 Daily Brent Blend prices since last September. Source: UpstreamOnline.com; image not in original article. Nevertheless, the fundamental behaviour of prices this year has been what some analysts ironically dub “wild oscillations”. The months of January and February have been filled with that kind of very close extreme variations; at least 11 cases were observed for the WTI variety in February alone: on February 10, declined 5% and climbed 10% on February 13; on February 17 declined 7% and climbed 14% on February 19; on February 23, declined 3.6% and climbed 4.2% on February 24; 6.6% on February 25 and 8.5% on February 26, then down again on the last trading day of the month. This reveals the high volatility of WTI's behaviour in this market. What will be the outcome of these extreme oscillations and whether the barrel price will again climb above $50 or fall below $30, depends, according to Eriksen, on the “balance” between two opposing forces. On one hand, the impact of the crisis on the demand for this commodity, continuing to reduce demand below 85 million barrels daily (mbd) – the last estimate by the IEA points to 84.8 mbd. This daily figure was still below the supply in January of 2009, that was around 85.2 mbd, resulting in a difference of 400 thousand barrels daily. On the other hand, there are several political and physical factors that can be expected to influence supply, producing scarcity in the market. Nothing has happened yet, in spite of the cuts planned by OPEC, that “should already amount to 89% of the commulative cuts announced since September that amount to 4.2 mbd, according to Bloomberg”, says Eriksen. The analyst emphasizes that, in the political arena, sudden geopolitical changes in oil-producing regions (namely in the Middle East that continues to be potentially flammable with issues like Israel/Palestine and Iran) or a collapse of the dollar due to the continuing financial crisis or to the political behaviour of the main American currency supporters, can make the crude oil price shoot up without previous warning. It would be the surging of separate “black swans” to the international scene. Physical constraints can also have a negative influence on supply. Eriksen indicates that the group of oil producing countries outside OPEC seem to have already reached a production peak, on a combined basis. In spite of good prospects in places like Brazil (that, nonetheless, can be expected to reach “a production plateau around 2011”, according to the studies of this analyst) and Canada for a few more years, global supply outside OPEC is diminishing, with high decline rates of around 20% in extreme cases like the Gulf of Mexico. In 2009, production can be expected to decline in Russia, Mexico, Norway and the United Kingdom. With respect to OPEC, a continuation of the policy of planned cuts is to be expected, with a reevaluation coming as soon as the 15th of March, when the cartel meets again. A pressure group formed by Algeria, Iran, Iraq and Venezuela is supportive of the policy of continued cuts, according to statements issued during the last week and a half. There remains great uncertainty about key OPEC producer Saudi Arabia's true oil reserves as they are kept as a national secret. The last time that Saudi had a production peak was in 2005 at 9.6 mbd. There is a risk that Saudi Arabia's true crude oil reserves could be much smaller than official estimates implying that future production will stay below the 2005 peak. For anyone who may have missed it, I suggest a viewing of Matt Simmons presentation posted on TOD US the other day. Matt makes the argument that oil not only will go up for all the reasons he states but that it SHOULD go up, in fact MUST go up,and soon. Despite what many people seem to think, a stable, rational oil price is not a bad thing, even if it is a bit higher than we have historically been used to(which in many cases has been insanely low). There must be some form of rational pricing structure to insure continued investment in the energy sector or we could end up with a catastrophe with or without peak oil that is purely logistical, and due to the long lead times needed in the energy industry massive dislocation could not be averted. As far as price goes, supply and demand seem to matter only at the margins. We cannot know if this is the time, but the hedge funds are certainly regrouping for an onslaught on the oil market, which means that any real predictability of price is virtually impossible. For the hedge investors, there is simply very little place for money to go. Interest rates are near 0% (leading to the surreal economic landscape in which money is free in a land where money cannot be gotten!) real estate and equity markets are in full collapse and still not trusted. One more dash to the commodity well is in order, followed by a dizzying ride upward, and then another price crash. Would the production of oil be up or down during in such a period? Who would care? Until we find someway to reign in the rogue money waves washing across the economic landscape, or offset them with an enourmous pool of capital from...?, we will be subject to this roller coaster until it shears the world economy into small pieces. And even then, when we are living in village communities cut off from all the advances we once knew, the crude oil will lie in the natural reservior never exploited. If your worried about climate change, the hedge funds may turn out to be your best ally, destroying the economic ability of the nations of the world to extract the oil that would heat the atmosphere. They are the economic equal of the vandals who in attack after small attack ripped Rome to shreds, except these modern vandals use dollars, yen and Euros instead of swords, axe and spear. "Peter Garrett. Every performance a sell-out". I think the idea of Black Swan events has been watered from the original concept. Black Swans are no longer identified with out-of-the-ordinary events, but rather with wilder swings in various metrics than we have been historically used to. That is why I see the term "Fat Tails" used more often than Black Swans to describe this kind of behavior. The Fat Tails refer to variances that are outside the parameters of a Gaussian/Normal distribution (as the example typically used to compare against, i.e the Black-Scholes model assumes derivatives about a normal). Oil depletion as practiced here on TOD is a case in point for doing the analysis correctly. The model I have been pushing for discoveries and reserve growth, Dispersive Discovery, has super fat tails that even a curmudgeon like Taleb would appreciate. The concept of dispersion pushes a huge amount of uncertainty in the model and you get the results of curves like the Logistic for global discovery and "hyperbolic" for reserve growth. For certain, we are not making the same mistakes here that the dickhead quants have done in the financial markets. Yes, if you can see that there are factors that could result in a massive increase, it's more like one of Taleb's 'Grey Swans' than a true black swan. A real black swan would be something more like some revolutionary energy discovery that is easily implemented quickly on the existing infrasturcture causing oil to become worthless, or perhaps a meteorite strike on Ghawar disrupting a large portion fo supply. In some ways, the invention of the shadow banking system was a black swan event, although that's a bit of a stretch. But yes, the term is overused nowadays. One would also have to consider the "alignment of the stars" kinds of situations, when a great many low probability events line up or an event occurs that exposes other dependent events. That has more to do with interactions amongst behaviors than a truly remote "unknown unknown". The Madoff Ponzi scheme is a case in point; last year's crash exposed this whole situation, so no one can really isolate that as a Black Swan event either. If it would have happened during good times, the world economy would have swallowed that up as a blip. People knew about the shadow banking system, so the fact that it finally got exposed to a great number of people through the financial crisis (chicken or egg, I know) so I agree that it is perhaps a stretch to consider that a Black Swan. Lots of people pointed out that it would turn out chaotic and would lead to wild swings into fat tail territory. But then again, it shows the basic futility of trying to predict processes that rely on human psychology, such as financial markets. Far from being a Black Swan, that's easily explained by human nature. Our greed and hubris make us susceptible to financial bubbles and various other get rich quick schemes. Without regulation and enforcement to keep us in check, financial markets will default to bubbles and crashes. We are warped from birth, true human nature hasn't been seen around this joint for eons. Greed and hubris are learned qualities. Not to disagree with your point about them being our current susceptibilities though. If oil prices are stable and rational then so is Jim Cramer. One of the few markets crazier than oil is North American NG. I don't blame hedge funds for all the volitility. You have a very capital intensive, very inflexible supply chain supplying a spot market with unpredictable needs and very little price elasticity. The result is chaos. One important point here is that $40 oil is not cheap. Ten years ago it would have been viewed as really really expensive. The second important point is that if $34 turns out to be the cycle low then we have a pattern of higher highs and higher lows. The low in 2001/2002 was about $18, and the low in 1998/99 was about $10. It's a classic uptrend. Regarding oil prices, I agree, and they rose for 9 out of 10 years, from $14 in 1998 to $100 in 2008 (annual average), and the fastest rate of increase was 2000, not 2008. The one down year was 2001, following the rapid 2000 increase. It remains to be seen what the average 2009 price will be. I've been looking at some price and crude production numbers (EIA). Let's use 5/05 as the index rate, 74.2 mbpd (which has been revised downward, from a higher estimate, I believe). The price of of oil (WTI spot) averaged $50 in 5/05. We have 43 months of data after 5/05. Let's go back to October, 2001--43 months after October, 2001 would put us in May, 2005. In the 43 month period ending in May, 2005, the cumulative increase between what the world would have produced at the October, 2001 rate and what we actually produced, through 5/05, is about 3.1 Gb. In the 43 month period ending in December, 2008, the cumulative shortfall between what the world would have produced at the 5/05 rate and what we actually produced, through 12/08, was about 0.95 Gb. For 42 of the 43 months, the price of oil exceeded $50. We did see one month--July, 2008, subject to revision, generally downward--that exceeded the May, 2005 rate and we did see some voluntary reductions in production in the fourth quarter of 2008. However, the 43 month period ending in May, 2005 showed increasing cumulative production, relative to the October, 2001 rate (in response to generally rising oil prices), while the 43 month period following May, 2005 showed declining cumulative production, relative to the May, 2005 rate (in response to generally rising oil prices). Whats interesting is using my reverse concept i.e we have a command economy and for a long time the availability of oil was a key factor in how fast it was allowed to expand you get the same result. As we entered the late 1990's the command economy was increasingly allowed to expand regardless of its effect on oil prices. Rising oil prices where no longer taken in to consideration for putting breaks on the economy. And I assure you despite the Feds claiming they don't look at food/energy prices as a guage of inflation this is exactly what they look at since this the key in determining of the economy is growing faster than its underlying resource base can be expanded. You can work the problem both ways however viewing it as our leaders becoming less and less interested in the expansion of real inflation in commodities shows that they for whatever reason no longer felt that commodity price inflation was important or controllable. This is compared to the previous decades where growth was far more controlled and commodity price inflation kept bounded. Thus if you look at it from the perspective that the managers of the command economy became unconcerned with the strain on commodity prices caused by monetary practices you get a telling result. This is why I like the way you look at this the economy was forced to grow despite this short fall in oil production. Also this problem was widespread across a wide range of commodities across the board growth was straining the supply of practically every single commodity. In the period October '01 to May '05 much of the increased production is from OPEC bringing spare capacity back into production. It is hard to get a handle on OPEC spare capacity because some of it is unusable for practical purposes. It would be my guess that the world capacity to produce oil hasn't increased much over the past ten years. The stagnation in production since 5/05 is particularly disturbing in the context of a massive energy investment boom. Given the amount of activity we ought to be seeing a large increase in production capacity. "$40 oil is not cheap" ROTFLOL, it is incredibly cheap when you think what can be accomplished for only $40. In Yurope we are paying the equivalent of $160/barrel and it's so cheap people are still buying gas guzlers. It is so cheap that although it took millions of years to form and is finite we are going to have burnt through most of it in only 100 years and in a large extent to take trips to the mall to buy plastic crap that we don't need. Unfortunately tax based schemes are clear so are unlikely to be adopted instead of something that is obscure and does not immeditaly impact them. Remember politicians have only two goals 1 to be elected, 2 to be re-elected. My favourite 'back of the envelope' calculation is to estimate how much oil we should use if we are to consider it a 'renewable resource'. I guess the point your making is it's not very much, whether a thimble or a pint. Even a barrel over our life time would would not help much. Well, if we made something useful from it that we could reuse or recycle when we were done instead of just burning it there'd probably be quite a lot to go round. One important point here is that $40 oil is not cheap. Ten years ago it would have been viewed as really really expensive. Does anyone have a good handle on how the cost of producing oil has changed over the past decade? I'm an outsider at this game, but it makes me rather suspicious to see OPEC members constantly beating this "we need oil to be $80/barrel!!" drum considering what their own desired price band was not so very long ago. In other words, surely the cost of production is getting more expensive, but has it really tripled or quadrupled in less than 10 years? Re: Increasing costs....Costs have gone up a lot, partly because drilling rig companies (and others) are making a lot more money. Some years ago, drilling costs were below rig replacement costs. Drilling rigs did not earn enough to make it worthwhile building new ones. That has changed. When OPEC complains about needing $80/bbl what they are talking about is the cost of domestic social programs rather than the cost of oil production. Not directly related but copper prices have followed a similar trend over the last three months, i.e. upwards from a low of $1.30/lb in December to around $1.60-$1.70 now. Copper is significant since it is used in many things and is sometimes seen as a reflection of activity in the economy. Maybe instead of turning a corner we have become accustomed to volatility, news of another billion or ten, it just doesn't have the same effect, after all Lehmans went broke and the world didn't stop. I was asked to come on CNBC this past Friday (March 13th) to discuss that article and crude oil prices. You can view that interview with Maria Bartiromo and I via the following link - which is also located on our blog. I am not sure it is appropriate to ask this question here but could someone please advise on which is the best way to invest in oil? Crude oil is definitely cheap at this level. I am looking at comparing between oil futures, options on futures , exchange traded funds such as USO, oil stocks and physically owning oil. So I am building a basket of stocks that are likely to do very well as oil/gas rebounds and also do well if we hit an energy crunch. Although the last year has shown the sell-off from a peak can be very severe I'm not so sure this would be as severe if the reason for the overall selloff was driven by the oil-supply issue. I.e. oil prices might run up again but not fall so fast/far. Do you people actually invest in hedge-styled funds? The most perfect (i.e. risk free) hedge fund is one that invests half in a market that is predicted to go up (long) and half in a market that is predicted to go down (shorting). The end result is that you on average don't make any money, or very little. In this case you might as well invest in CD's. I don't go for any of these kinds of scams, because it is all a zero-sum game in the end. Philosophically, I have a hard time with trying to out-game someone to make money. What you are describing is very common. You make a lot of money on the fund that works and the shareholders of the banks that lent you the capital eat it on the one that doesn't. This is why relationships with those entrusted with capital (bankers) are so prized. You make a lot of money on the fund that works and the shareholders of the banks that lent you the capital eat it on the one that doesn't. You make a lot of money on the fund that works and the taxpayers eat it on the one that doesn't. The taxpayers eat it after the shareholders are sucked dry. Ahh, but you are forgetting the awesome power of leveraging. Hedge funds capitalize on small spreads by borrowing huge sums, keeping the spread, and repaying the principle. Voila, outsized returns! So the low-risk on some of the hedge funds got magnified by the huge leverage in essentially borrowed investment dollars. It no longer stands at low risk because of the leveraging and the amount you would have to pay back if it went the wrong way. Then all the big wheeler-dealers have to do is go bankrupt or scream for bailout money. They're called hedge funds because if they gain they gain, and if they lose they are bailed out, so they're hedged. I think a close relative to the Black Swan is the "whocoodanode". I noticed that Krugman has taken this one up after Atrios and other bloggers began using it. The "whocoodanode" is essentially a Black Swan that a minority of people screamed about for a long time but no one else listened. The result was a sarcastic "whocoodanode" event. I'm not actually invested in a hedge fund -I'm just hedging my bets! (against PO happening soon). If we get to 2020 and it turns out that there is plenty of oil then the next decade probably won't be so bad. Yes, it's selfish, but what am I to do? Of course it's selfish. But I'll let you into a little secret - we're all selfish! It's part of the human condition and anyone who pretends otherwise is lying. Yes, there are other PO agenda's and some of these are very socially-focussed but it's perfectly OK (in my book at least) to also want your own life, and that of your family, to be protected against whatever might be coming. And that includes any wealth you have accumulated. Investing for PO shouldn't be seen as a dirty concept and unworthy of TOD. In fact it would be nice to see a whole seperate thread along the lines of how best to protect your wealth in the years to come. I'm sure we all have ideas and many of us probably have significant savings we would like to hang on to and maybe pass on to our children. My opinion would be the ETFs. You could actually calculate your oil related monthly expenses and hedge them by buying an oil related ETF. There are also commodity related ETFs that include oil...agriculture runs on oil. As to what you would be doing for the environment or depleted oil...probably not much. please advise on which is the best way to invest in oil? Basically, don't. The cheapest way, with the most leverage, is Futures Options. They cost from a few hundred to a few thousand for a standard sized contract. COmpared to buying physical Oil (which many Brokers won't actually let you do (which will cost the thick end of US$50k at the moment (where will you store all those barrels anyway?). We're Paper Trading Iron Condors at the moment. Seems about as safe as things can get on The Market! at the moment. Thanks to both Luis and Ace! This is an interesting post. The big question I have is what demand looks like going forward. If the credit unwind continues (as I think it must), it suggests that demand won't rise much at all. If this is the case, oil prices may not rise. What thoughts do people have about demand going forward? There is some belief that food prices may shoot up (but perhaps not for a year). See this WSJ article. If food prices shoot up, demand would drop sharply. I suppose one could get a near-term run-up in oil prices, followed by another crash as food prices shoot up (if the run-up in oil prices is not self-limiting). If food prices shoot up, you'll KNOW its a scam. Raw farm product prices make up only maybe 5% (wheat products) to 20% (fresh meat) of the rtail price you pay for food. So it's a scam even before it shoots up, what's new? The IEA has just released their March 2009 OMR highlights. 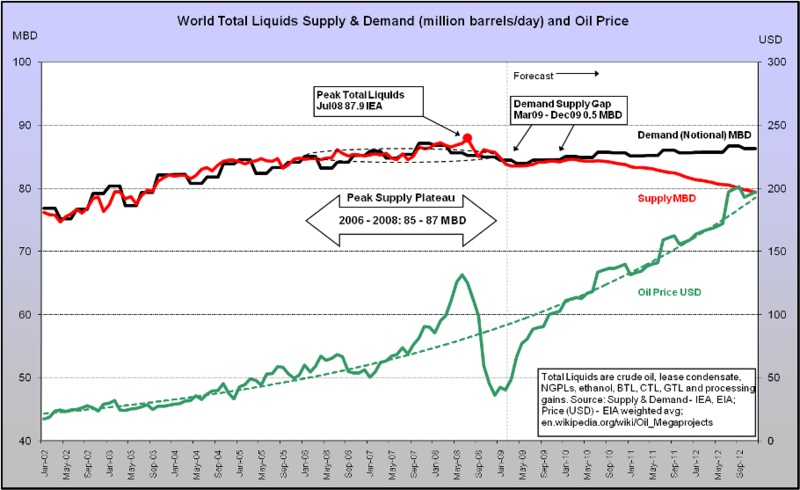 The IEA says that Feb 2009 oil supply was 83.9 mbd and that oil demand for 2009Q1 is about 84.5 mbd. That's a demand shortage of 0.6 mbd which should be bullish for oil prices. If demand stays constant and OPEC complies with 100% of its 4.2 mbd cuts rather than 80% in Feb then there should be more upward pressure on oil prices. Below is my chart updated for the IEA OMR. The supply demand gap is forecast to average 0.5 mbd from Mar 2009 to Dec 2009, assuming that OPEC keeps complying with 80% of their cuts until Jun 2009. If I assumed we were going into an increasing set of price oscillations along with the general upward trend, eyeballing that graph I'd guesstimate a price run-up to around $175 in Summer of 2010. Maybe but I'd suggest at the moment with the current large storage levels we don't have a good handle on prices for the rest of the year its tough to guess where they will end in 2010 and of course at some point financial games i.e US monetizing the debt will have and effect on the value of the dollar at least vs commodities. It could be 75 or 250 ..
Bottom line is we will have to see our June/July numbers first before we have a clue where then next bounce is going. Probably the best way to estimate demand is by a combination of estimating future global gdp and looking at the historical link between gdp and oil consumption. Rummaging around on the web, if you take the period 1985*-2003 then global gdp increased 78% and global oil consumption increased 33%. This gives a change of 1% in gdp corresponding to a change of o.4% in oil use. So even if you project a very gloomy 5% fall in global gdp this would only correspond to a 2% drop in oil consumption. However, the period between 1985-2003 was a relatively stable one for oil prices. The relationship with gdp may be different if the price remains either higher or more volatile. You might then need to look at the effect on discretionary use (e.g. casual driving) as distinct from non-discretionary use. These different forms of use will probably have different levels of impact on gdp. Not impossible to model but you quickly get into dangerous waters with too many assumptions and factors. Will take a braver person than me! *I've deliberately not gone back before 1985 because there was a period of significant substitution of oil in non-transport sectors of the global economy. The drop in oil use during the early 80's reflects this substitution which would be hard to replicate today. While I tend to agree with the notion that oil prices are at, or very near a bottom, and that they will generally rise over the long term, the number of variables impacting "price" makes it difficult to work with. As Gail pointed out, if the global economy continues to shrink, and demand shrinks with it, then the price question will turn into a horse-race over whether supply or demand shrinks faster. Similar issues with currency fluctuations, geopolitics, etc. 1. We need to look at long-term cost. A brief spike such as the Summer of 2008 has far smaller implications for human civilization than does the general up-trend over the past decade. Annual average cost seems like a good place to start. Excellent point 2. Many people seem to forget about exchange rate fluctuation effects on oil prices. Probably too early to say if this is the bottom, we're already seeing a bear market rally in stocks and this could be part of that. I would expect the bear rally to last some time so it might be possible that oil hits 70 dollars or so before crashing down to even 20 dollars or less. It all depends on the "demand destruction" resulting from the deterioration of the economy. Not looking at the extreme edges but at the yearly average, prices did not go down that much: 100$ last year compared to 40$ this year until now. I think it is reasonable to estimate an average price of 50$ for 2009. In Euros the difference would be even less: About 70€ last year compared to about 40€ this year, due tu a stronger Dollar. Now let's assume that about 30% of last year's average was because of short term speculation, speculation that still did not return to the oil market, we see a "real" price of around 50€ a barrel in 2008 compared to 40€ a barrel in 2009. Not much of a difference. I though our latest blog posting, which pertains to this week's inflation data and their relationship to oil prices, may be of interest to your readers. Here's the link.